… attempts to identify how interlocking systems of power impact those who are most marginalized in society. Have you seen the trailer for the Ai Weiwei film Human Flow? Growing hardened to the suffering of others endangers us all. We chose this film in collaboration with the Golden West College Peace Studies Program as an optimal pre-conference event for their 12th Annual GWC Peace Conference, “Peace and the Global Economy: Emerging Issues & Practical Solutions” — Friday April 20, and Living Ubuntu’s “Connecting the Dots: Finding Compassion Despite Our Differences” — Sunday April 15. “Human Flow” will screen on Thursday April 12 (free admission | vegan refreshments). 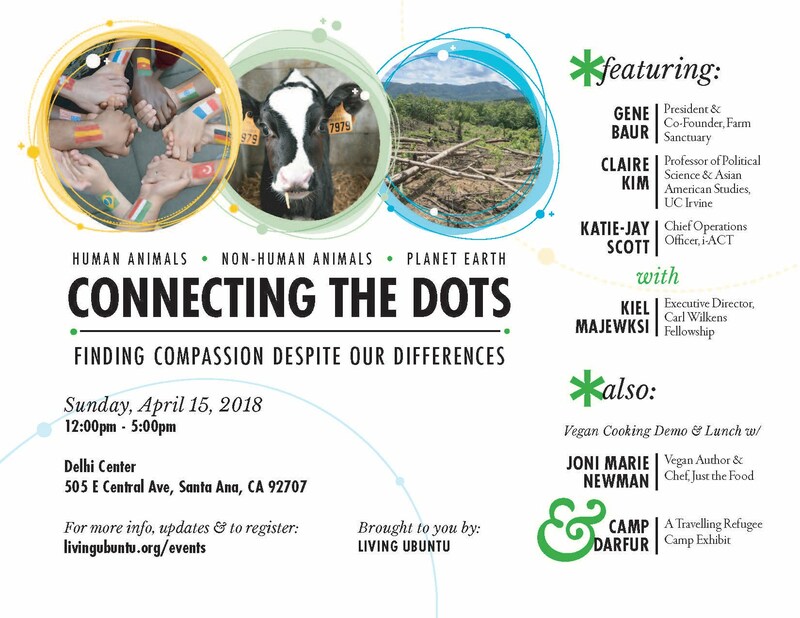 As if that is not enough, Carl Wilkens, the only American who chose to stay throughout the 1994 Rwanda genocide will be talking about Respect-Empathy-Inclusion (REI) at Fullerton College on Wednesday, April 25. He was highlighted in the PBS Frontline documentary, Ghosts of Rwanda, view a clip here. To close out the month, Intro to Tension & Trauma Releasing Exercises: Connection, Compassion and Community is back. Join us Saturday April 28 for this free event with vegan refreshments. There is limited space at these events. Please make sure to register. To find all six events all in one place: Living Ubuntu Events. Unlike a worldview based in belonging, the wound that disconnects perceives “Other”. We need not look far in today’s world and historically to find that those who lack institutional power are often commodified and subjugated to the insidious, authoritarian, patriarchal dominance of hierarchal oppression. In contrast to self-assurance, many feel threatened. Some are terrified. And we are all diminished when this occurs. At this critical point in time when there is so much at stake, it is imperative that we rapidly, significantly, and authentically change the narrative. This will require that we go deeper inside ourselves and with each other. We must identify and “own up to” where we have fallen short, normalize kindness, and learn “repair” to come back into healthy states of connection after inevitable breaches have occurred. This is the essential opportunity to expand our point of view in recognition of the necessary interdependence that is Gaia, the interconnectedness of the all, the whole of life that sustains us, that we in turn sustain as part of it. When the conventionality we have been indoctrinated into has grown destructive and obsolete, it is time for transformation. An Evening with John Hall, Kindness Amidst Chaos, Stories from Lesvos was scheduled to take place this coming Friday evening. Due to unforeseen circumstances, John is not able to be with us on February 9. Most unfortunately the event has been cancelled. We will reschedule with John hopefully very soon as the topic is extremely important. As soon as we know when that is going to be we will let you know. Our apologies for any inconvenience. Meanwhile, please save this date: Sunday, April 15 (12p – 5p). We are planning to take the conversation deeper with a very special event at the Delhi Center in Santa Ana. 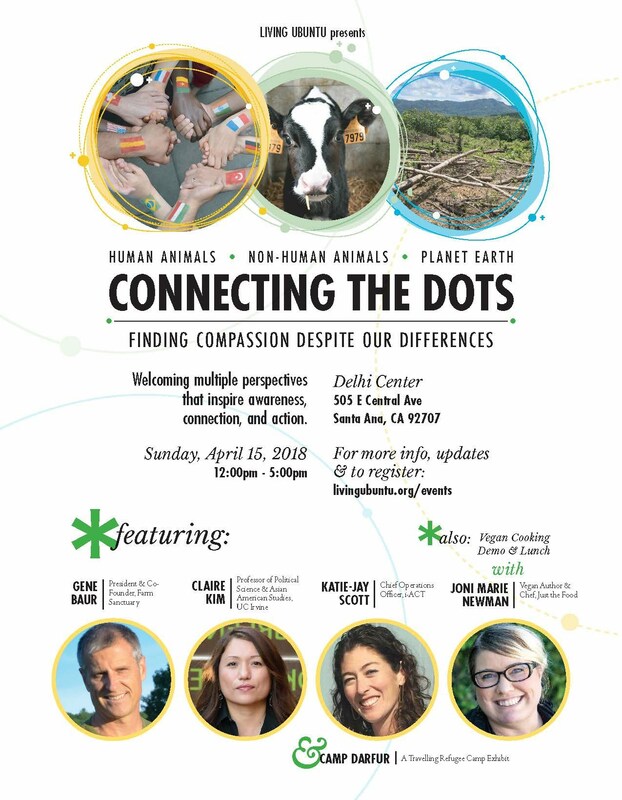 This highly intersectional and experiential discussion will focus on transforming our prejudices into increased sustainability and compassion, and will feature Gene Baur (Farm Sanctuary), Claire Kim (UCI Poli Sci), Katie-Jay Stauring (i-ACT), Kiel Majewski (Carl Wilkens Fellowship) and Joni Marie Newman (Just the Food). BTW: Would you like to volunteer with Living Ubuntu? We are looking for a few more who might want to join our volunteer team to help us plan for April 15 and other events and advocacy efforts coming up soon. If you want to jump in with us, just send an email to: info@livingubuntu.org.